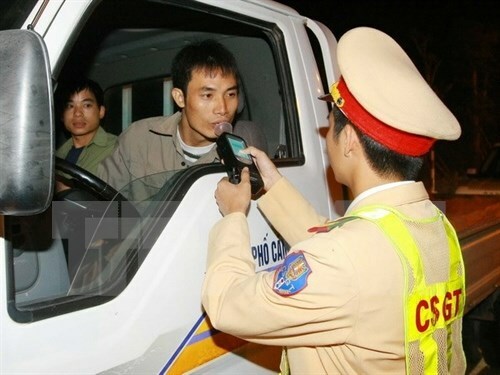 Hanoi (VNA) - Drunk driving or refusal to comply with a police ordered alcohol and drug test will now attract penalties of up to 18 million VND (800 USD). The new rules are included in Decree 46/2016/NĐ-CP, recently issued by Prime Minister Nguyen Xuan Phuc, to ensure road and rail traffic safety. The new decree, with stiffer regulations to ensure traffic safety and order, has increased fines on some traffic safety offences to replace and fix weaknesses in the two previous orders. It comes into effect on August 1. Under the new order, the penalty on drivers with alcohol exceeding 80mg per 100ml of blood, or 0.4mg per litre of breath, will increase from 10-15 million VND (445-670 USD) to 16-18 million VND (710-800 USD). The driving licences of those who are found with drugs in their system will be revoked for 22-24 months or they will be fined 16-18 million VND if they do not have a driving license or it has been withdrawn. The decree also states a new regulation under which those who steer their vehicles with their feet will incur a fine of 7-8 million VND (310-360 USD). The same penalty will apply for speeding and swerving the vehicle recklessly. Violators who fail to follow the police’s order to stop or cause traffic accidents will face a penalty of 18-20 million VND (890 USD). The decree also says umbrellas, earphones and mobile phones cannot be used while riding vehicles including motorbikes and electric bikes. Assisted listening devices for the deaf are, however, permitted. Those who fail to comply with this regulation will receive a stiffer fine of 100,000-200,000 VND (5-9 USD), compared to the current fine, which is only 60,000-80,000 VND (3-4 USD). Motorbike riders and pillion passengers aged above six without helmets or are wearing it incorrectly will be fined 100,000-200,000 VND. The fine will not be applied in emergency cases or for those who are accompanying the violators. The government hopes the new regulations will improve public awareness on road and railway safety and reduce traffic accidents. According to the National Traffic Safety Committee, from December 16 last year to May 15 this year, there were more than 8,300 traffic accidents, resulting in more than 3,500 fatalities and over 7,300 injuries. The road traffic police fined over 1.5 million people for violating traffic safety regulations, collecting more than 1 trillion VND (45 million USD) in penalties. A total of 140,256 people had their driving licences revoked.